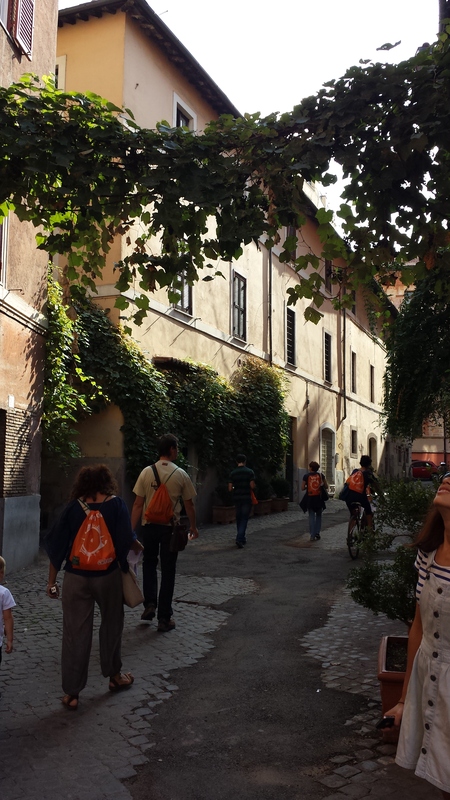 I’ve lived in Rome for five years, but what I love is that there is always more to discover. I am the eternal tourist. Wandering these cobbled streets and getting lost amongst the alleyways of Rome reminds you that if you think you’ve seen all there is to see, you couldn’t be more wrong. These three organised urban walks uncover further layers, taking you to places that otherwise might be left unexplored. through an unassuming wooden door into a spectacular 14th century courtyard. I walk these streets at least once a week, yet I never knew the stories or that some of these places even existed. What is wonderful to see is people so passionate about their city sharing these treasures and Romans so keen to know more. Some tours are held in English too. Find our more about their next events at the FAI website www.fondoambiente.it There’s also an app for you to explore on your own. 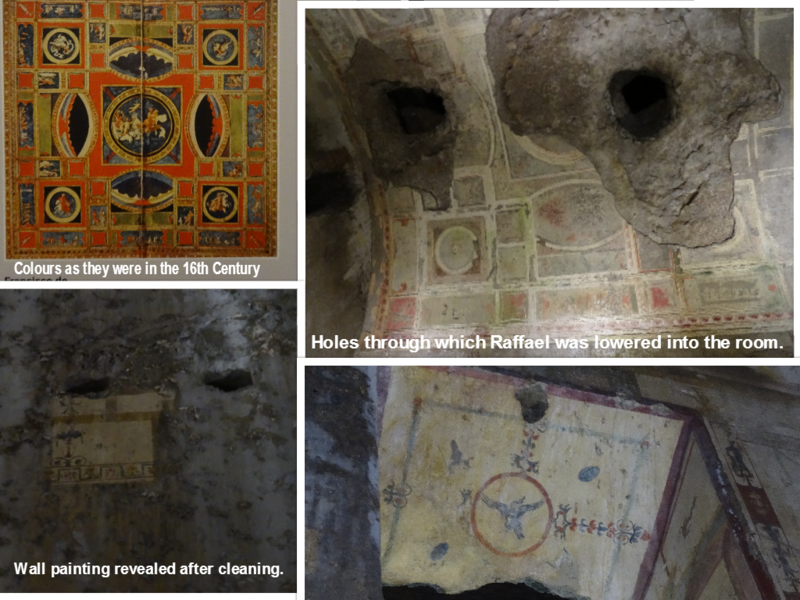 Much of Rome’s past lies inaccessibly buried beneath our feet. 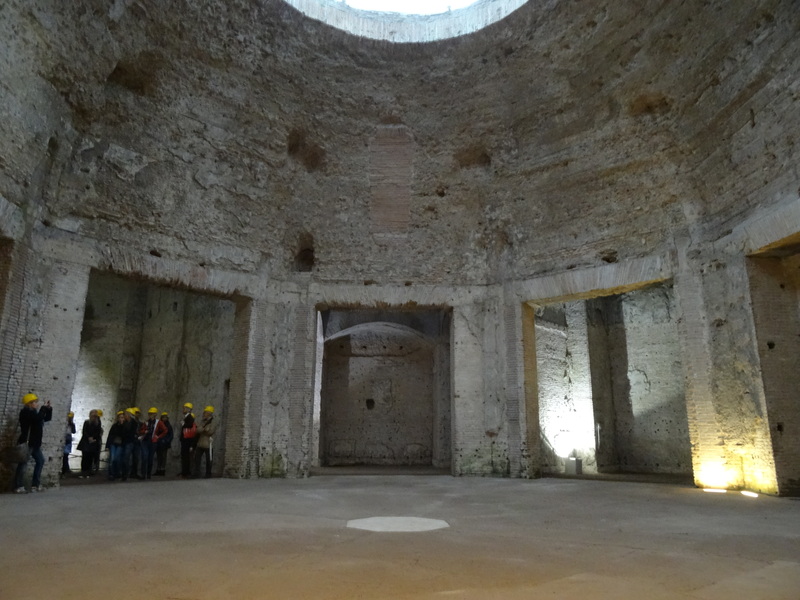 Emperor Nero’s Golden Palace, the Domus Aurea, has just been re-opened to the public after years of closure. 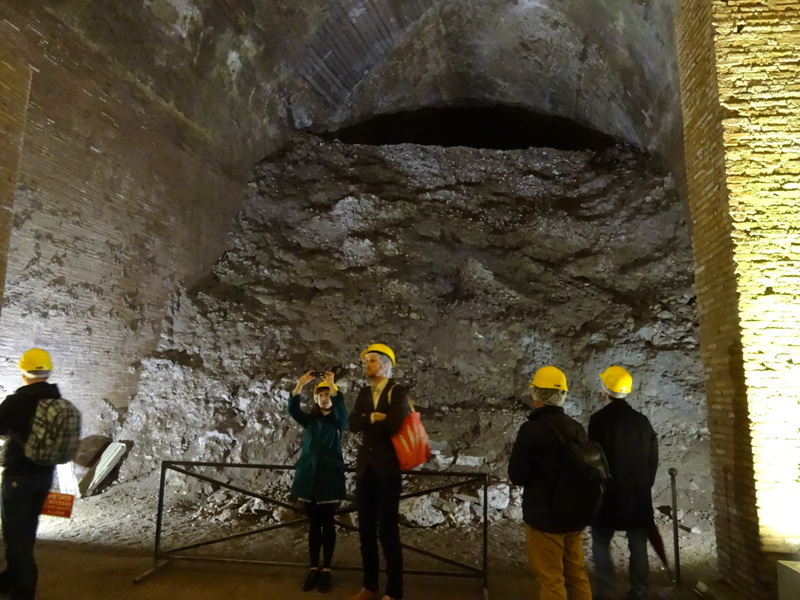 The party palace of one of Rome’s most notorious and extravagant emperors is a walk into the bowels of Rome’s imperial past. Robert Hughes describes the palace as “one of the legendary structures of antiquity” and by Michael Grant as “the largest piece of land that any European monarch has ever carved out of his capital to make a residence for himself.” Ever so slightly mad Emperor Nero said he was “at last beginning to be housed like a human being.” Even buried deep underground, even though much is still out of sight, it is still just possible to imagine the scale and magnificence of this huge sleeping palace. Nothing of the gold, mother of pearl, precious stones, marble or ivory decoration remains. But incredibly the wall paintings do. When Renaissance master Raphael was lowered through the roof, the paintings were still in all their well preserved glory and inspired a generation of artists. 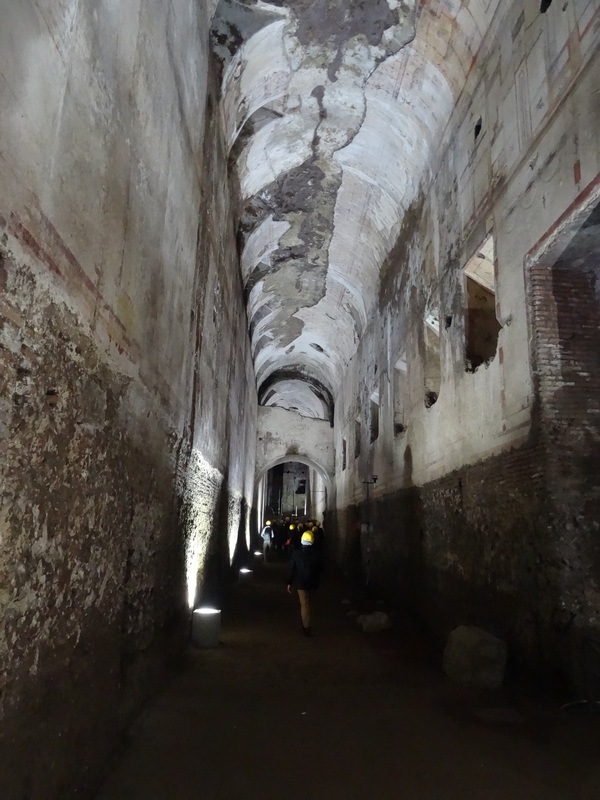 Excavating this vast site which was filled with earth and rubble after Nero’s death, began in the 1700s. More recently, the weight of the parkland above and roots of trees have caused huge damage. In an ambitious project, work is now underway to fortify the structure and renovate the interior. Thanks to John and Jenni for arranging what was an incredible experience which I cannot recommend enough. My own favourite, the amazingly well-preserved octagonal room with it’s concrete dome and oculus skylight. There are guided tours on Saturdays and Sundays until March 2015 with tours in English and Spanish. For more information and to book a place visit www.coopculture.it/en/heritage. 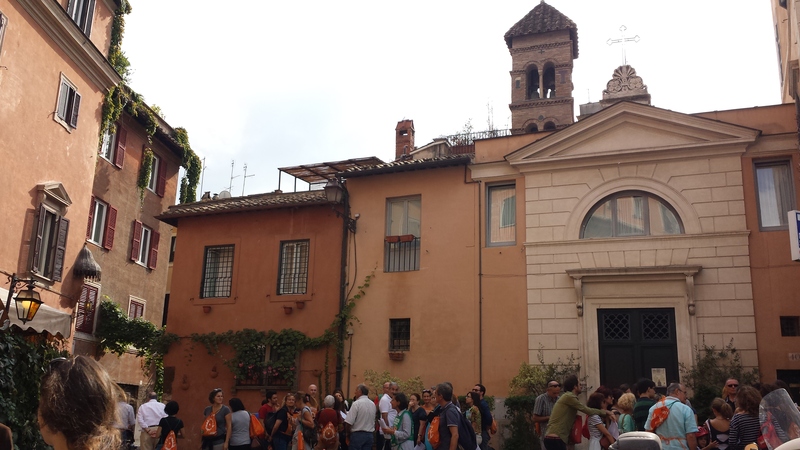 Part 2 Walking Irish Rome to follow soon. Previous The Return of Puntarelle! Eating your greens in Rome has never been easier.